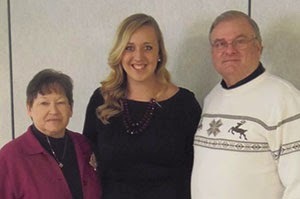 Macy Warburton, an at-large representative on the Elks Scholar Advisory Board, reflects upon her recent graduation from Kansas State University, and what the Elks have meant to her throughout her college career. Looking back a few years, I can clearly remember receiving the notice that I had been awarded a Most Valuable Student scholarship. 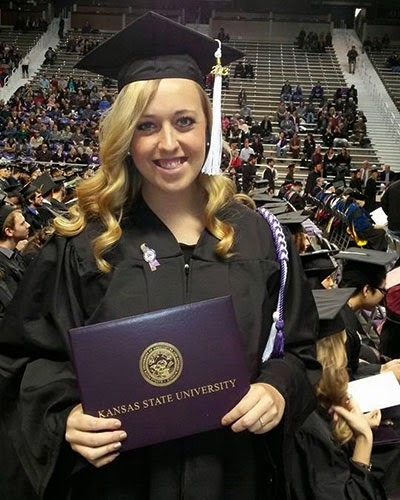 Now, as a recent graduate of Kansas State University, I am able to look back to my college graduation and remember the time that I was awarded my undergraduate degree. Where has the time gone? The moment I walked across the stage at graduation to receive my diploma was a moment that came with many emotions. I often have heard stories of people’s lives flashing before their eyes, and to be honest, graduation was a lot like that. In an instant, numerous college memories came to mind—from all the exams I had taken to all the people I had grown close with over the past few years. It was then that I realized how meaningful that moment actually was. Graduating college means more to me than recognizing that I had done well enough to pass my classes and receive my degree. It means that I am a better person now than I was just a few years ago because of the many people and opportunities that have allowed me to grow in all aspects of my life. and his wife celebrate with Macy. One major highlight of my college career that stands out far beyond the rest is being an Elks scholar. Beginning college, I was extremely thankful for the financial help the MVS scholarship provided me. Now I am thankful for this and so much more. Being an Elks scholar gave me connections, support, service opportunities, and a whole lot of fun. The Elks have allowed me to serve alongside them at Hoop Shoot contests, help engage new scholarship recipients, and simply become a member of the Elks family. They have truly been there for me through it all, teaching me to take advantage of every opportunity given to me and to care for every person I meet, while always having fun in the process. All in all, graduation has shown me that I am not taking a final step, but rather a beginning step into the rest of my story. I am ecstatic to know that the Elks will continue to be an integral part of my life as I continue this story.